The funding programme run by ONE Haverhill Partnership has provided vital funds for a number of worthwhile groups in the town while also allowing new projects to start up. Sarah Howard, chair of ONE Haverhill Partnership, said: “We are very proud of the impact we have been able to make through the community grants scheme. “They have made a significant difference to organisations and groups in the town and have therefore made Haverhill a better place to live and work. “In the latest round of grants, we want applicants to prove that their project falls within the priorities of ONE Haverhill Partnership – namely improving employability skills or wellbeing or reducing crime and antisocial behaviour. Health-based initiatives, sports group and art and culture programmes have all been supported since the scheme was launched in 2012. 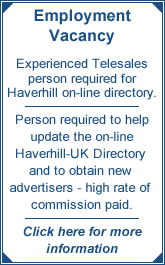 Groups can apply for up to £5,000 with the final decision made by a special committee formed by members of ONE Haverhill Partnership. Grant application forms can be downloaded from http://www.onehaverhill.co.uk/community-grants and sent to ONE Haverhill Grants Scheme, Haverhill Town Council, Haverhill Arts Centre, High Street, Haverhill, Suffolk, CB9 8AR. Or for an informal chat about your application, contact Nick Keeble on 01440 712858.